I drove my car on my recent jaunt to Louisville instead of flying. The return trip was about 9 hours long — not including bathroom breaks and stops at Value City Furniture. On the way to Louisville, I had seen that there was a Value City Furniture store, and I made specific plans to stop there on my way back to see if I could score some bookshelves with some decorative flair for somewhere in the house. Instead, I came out with floor lamps — two of them. Oh, clearance section — you get me every time. One lamp is for the living room. I’ve got to track down a shade for it in the near future, but I’ve been thinking of putting a floor lamp beside the couch for some time since I want light coming from overhead when I sew not from beside me as it is cast from the inadequate table lamp. 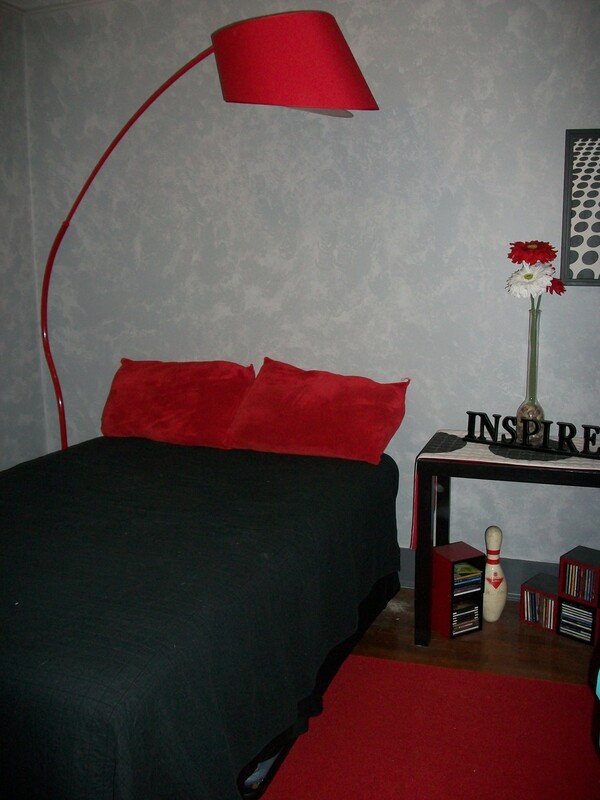 The other lamp is for the black and red guest bedroom. Here’s the before shot. The first thing that you should notice is the paint job that my sister did in the room. I love it. If I do decide to move, I’m going to miss that paint job, and we can’t replicate it exactly because we did some crazy mixing of a few different colors and glazes until she was (sorta) happy. She hated how the room turned out, but I wish I could peel the walls down and keep them. The picture actually doesn’t do it justice because the blending of colors is more subtle in reality. Anyway, when I found the lamp, I know that it was the same red as the rest of the room. I’ve had this room in one iteration or another since my grad school days when my mom and sister surprised me when I came back to my new digs with tons of cute red accessories from Target. They were worried that my black, white, and red decorating scheme had taken a sharp turn towards just black, and they were worried that is signified deep impending distress about moving 9 hours from family. So, they decided I needed more red in my life. So thoughtful of them even if I really wasn’t sinking into distress. The floor lamp that I found had a tag that said it was 85 inches high. Clearly, that wasn’t going to fit into Gretel, a car with only 48 inches of cargo space. I had just checked on that cargo space because I really, really wanted to buy a table that was on clearance. I saw a small wrench taped to the lamp, but for the life of me couldn’t figure out where to break it apart. I wasn’t even 100% sure that I wanted it. Would it fit? 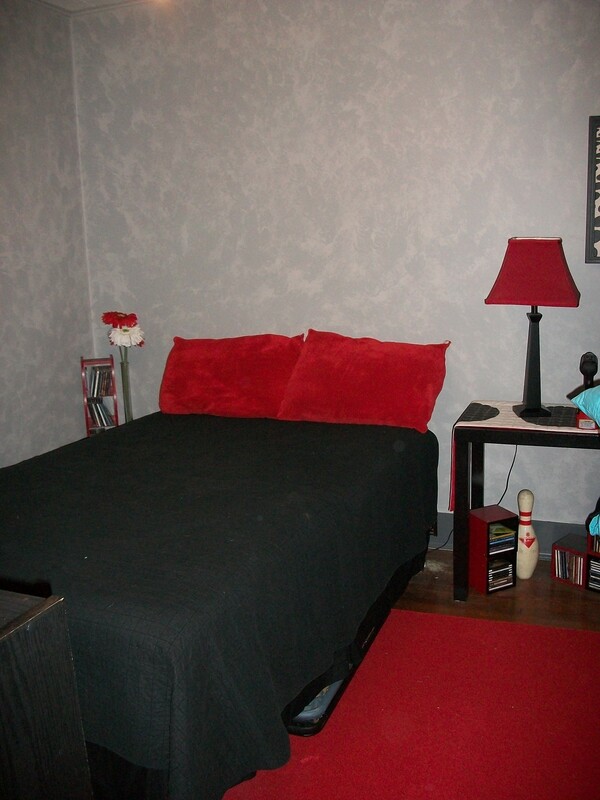 The red and black room is the smallest of the bedrooms in the house. Was it really, truly the right red? Also clearance me and frugal me were fighting a battle. I know that sounds strange, but it’s possible. Clearance me was on a clearance high. The lamp was originally $230 dollars, a price that to me is quite unthinkable for a lamp. It was marked down to $50. So clearance me was doing an internal happy dance that such a unique find could be had for over 75% off. Frugal me was still recoiling that the lamp was $50, which is still at the very outer reaches of what I’ll ever pay for an accessory in the house. Really, I’m running through all the accessories in the house….there may be a few groupings of wall hangings that came out to about that, but if someone breaks a vase in my house, there is a distinct chance that they’ve only busted up $4 worth of glass. In the end, I decided that since I had worked overtime and since I plan for a black and red room to stay in my life for a long time to come, I would buy the lamp (after I told myself that I could probably off load it on Craigslist if I got it home and really didn’t like it). Here is it. I’m still not 100% sure that it doesn’t overwhelm the room, so it’s on lamp probation. I think once the headboard is installed, the height of the headboard will help tie the lamp into the room more cohesively. I need to get to work on that headboard; I have the rough draft of it in my head, and it involves and old door and houndstooth. I also need to beef up the collection of pillows on the bed. I have a plan in mind for them too. Perhaps I’ll sew them by the light of the new living room floor lamp. It was pretty ridiculous to drive home with one floor lamp poking me in the elbow and the seats all folded down. It’s definitely not the typical person’s restroom break. What can I say? I was raised by a mother who once got so bored on a road trip that she pulled over with my sister and I to play a round of mini-golf before getting back on the road. This entry was posted in decorating, that's life and tagged decorating. Bookmark the permalink. I love the lamp and I am tucking the mini golf idea away for when I’m a mother!!! Love it.